Virtual reality, also called immersive multimedia by some, may well look futuristic, an effective predecessor to the ‘feelies’ described by Aldous Huxley in Brave New World. Indeed, the science fiction feel of this piece of modern technology cannot be shaken off; virtual reality or VR simulates real or imaginary environments. Once you have the headset on, it becomes hard to believe that what you are watching is completely computer simulated; the images are real, and immersive in every sense of the term. Some time back, Facebook spent a whopping $2 billion on obtaining the Oculus Rift, the first time virtual reality was formally introduced to the world. Let’s explore the reasons why the social media giant felt virtual reality was worth investing on that much money. VR can make education more real thing: Think what studying history would be like if you could actually be where the events happened and saw things with your own eyes. And engineering would be easy of you saw how structures are built from all angles. It effectively has the potential of making education a more entertaining experience; the student will be seeing and experiencing things, something that mere textbooks and images will be unable to impart. Not just that, education will no longer be confined to the classroom; the student will be able to study everywhere with a VR headset and a mobile device. Military training: Today, military training in many countries around the world has started to incorporate virtual reality. As a result, soldiers in training no longer have to rely on mock wars; they are immersed into real wars and face the situations they will find themselves in the actual war. Pilot training: With virtual reality, flight simulators have come a long way. Pilots in training are given the experience of having actually being up in the air and learn how to handle the controls. They can experience air turbulences and see what it is like to be actually up in the air with a very real airplane. Social media might become really personal: As virtual reality takes over, people will routinely use it to consumer content from the internet. More and more websites will become VR-friendly, and social media cannot be too far away. It can be safely assumed, therefore, that social media will take huge strides in making online interactions a lot more personal than they are today. Virtual reality can relieve pain: According to some recent research, it has been theorized that virtual reality can help patients cope with pain. This is because thoughts and feelings play a huge role on how our brain perceives pain; for instance, feeling very happy about something can momentarily distract us from the pain we feel due to a chronic illness or an injury. The study suggests that patients undergoing painful or uncomfortable procedures, such as dental treatment, can get a certain amount of relief if they are involved in something completely different and preferably interactive, like a video game. Games in virtual reality provide a more enhanced experience to the player, thanks to the immersive nature of the technology, and patients can benefit from it by pulling their minds away altogether from the unpleasantness of the situation and into something actually enjoyable. Immersive entertainment: Let us not forget how entertaining virtual reality can be. Imagine watching a magic show on your VR headset. Or maybe a trip to Disneyland, but only virtually, or playing a video game. Virtual reality will make each of these experiences a lot more real and a lot more fun. Movie watching experiences will be taken up quite a few notches too, and trips to places you’ve never seen will be just short of visiting the place in person. 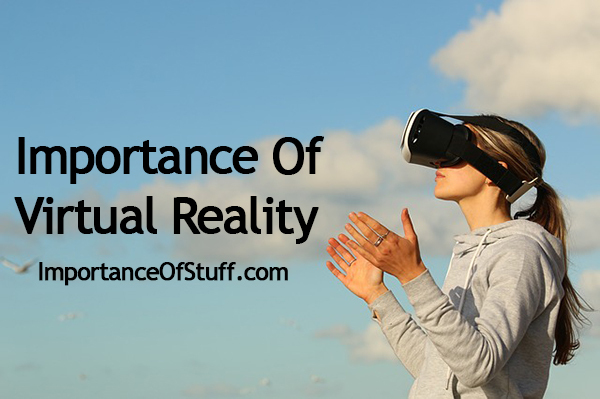 Virtual Reality is here to stay, no doubt about that. It is convenient, entertaining, and capable of taking groundbreaking strides in human advancement- throughout fields ranging from archaeology to engineering. And the good news is that with more and more technology giants catching on to this trend, VR headset are likely to become much more inexpensive than they are today.